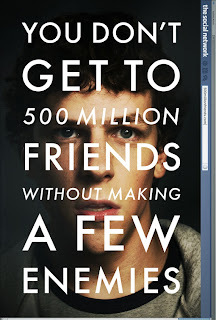 "The Social Network", otherwise known as "The Facebook Movie", is one movie I should have reviewed a long time ago. Facebook is a big part of our world today, whether we like it or not. Everything is on Facebook, even Movie Critical is on Facebook (free plug!). It's hard to imagine what life was like before Facebook. What did we do when we were on the internet? We didn't spend as much time on it as we do now. I am on Facebook right now, how about you? It's not hard to understand why Mark Zuckerberg is such a powerful man. Anybody who creates something that ultimately becomes part of our lives is a very rich and powerful person. The concept of Facebook really seems quite simple, so couldn't we all be billionaires just by thinking up something that seems obvious and then putting it into motion? It is quite empowering though isn't it, anybody can be an entrepreneur. Of course, you need contacts and finances to get it going. "The Social Network" can be empowering, if you let it be. Don't be empowered to betray all your friends though, that's not really a nice thing to do. So how much of "The Social Network" is true? That is what everyone wants to know. Mark Zuckerberg wanted everyone to know taht even though he is not depicted as so in the film, he really is quite a nice guy. Zuckerberg has said that there is many inaccuracies in the film, but the film makers did get his clothing right. "The Social Network"is based on the book "The Accidental Millionaires" by Ben Mezrich, which is a piece of fiction. It is based on actual events, but there is a lot of exaggeration involved. However, what is exaggerated makes good entertainment. On December 15th 2010, Facebook founder Mark Zuckerberg was named TIME Person Of The Year. Zuckerberg is no doubt one of the most influential people in the world at the present time due to his major success in the business world with Facebook. "The Social Network" is the film based on his rise to success and fame and all the bits in between. It is not the most accurate of films, but is definately good entertainment. "The Social Network" is immaculately made. It is thrilling, unsettling at times and an absolute pleasure to watch. David Fincher has once again shown his film making talent, turning a film that could have been a typical college film into a dramatic and tidy piece of art. Jesse Eisenberg is Mark Zuckerberg, the Harvard student who is a little too much of a genius for his own good. He's not popular at all and all the girls think he is a jerk. However, when he creates The Facebook his luck changes. What was first supposed to be just a social network for Harvard students starts to reach schools across America and then across the world. 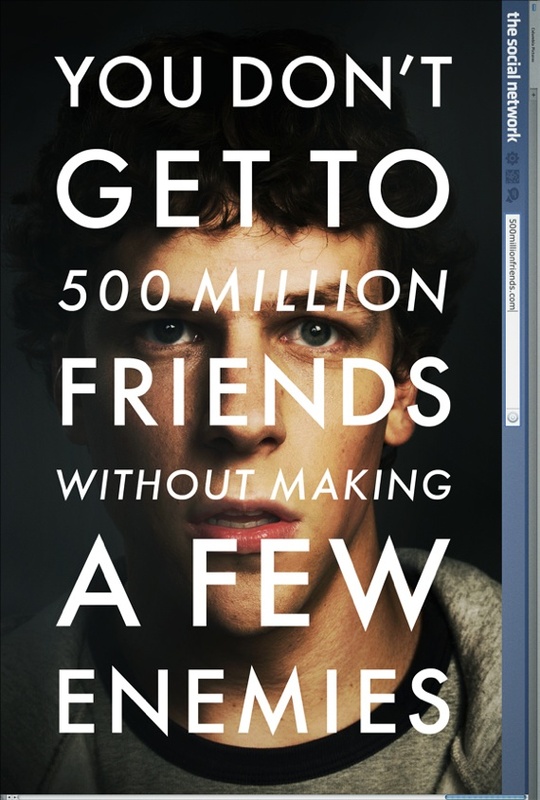 However, as the tagline for this film says, you don't get to 500 million friends without making a few enemies. "The Social Network" was one of the most anticipated films of 2010 and also one of the great successes. It is nominated for 6 Golden Globes including Best Motion Picture-Drama, and deservingly so. Without the right director, it could have been cheesy and just another film about American college lofe. Fincher was the perfect director for the job. The musical score is perfect for each scene, especially the rowing regatta scene, and the cinematography is brilliant. The editing is perfect and the film is full of little surprises for each scene. In it's own way, it is a lot of fun to watch the film and there are many scenes which will ring true to how Facebook has changed interation in the world. For example, when Eduardo's girlfriend, Christy says to him "How come your relationship status on Facebook still says you're single?" The script is also very clever and witty. The opening scene with Mark and his then girlfriend, Erica is a great piece of scriptwriting. Their banter and conversation piece is a brilliant way to start the film and get the audience's full attention from the word go. The ending of the film is probably the only thing that seems a little out of sorts. It ends quite abruptly and it feels like it ends where it does because it isn't quite sure where it should go from there. Jesse Eisenberg was a great choice to play Mark. He plays the part so well. He isn't the stereotypical nerd you normally see in films, but he still differentiates himself from the "cool" crowd at school. Eisenberg is extremely unsettling at times and can seem quite evil considering how obsessive he becomes. Andrew Garfield gives the best performance of the film as Facebook's co-founder, Eduardo Saverin. He is brilliant and scene-stealing and could well be taking home the Best Supporting Actor Golden Globe he is nominated for. Unlike Eisenberg's character, he is extremely likable and has that "good guy" air about him. Justin Timberlake gives the best performance of his career so far and it is ironic that a successful musical artist plays the character of the person who people in the music world strongly dislike. Rooney Mara is also perfectly suited to smart talking Erica and Disney personality, Brenda Song shines in a role that is completely different for her. Overall, "The Social Network", like the man it is based on, is a great success. It is well written, well directed and well acted. A great film to see for anyone who is on Facebook...which is almost everyone. To be honest, I didn't really see Zuckerberg as this completely terrible bad guy. I actually thought that even though Eisenberg's portrayal was a bit unsettling at times, and even though the film was obviously trying to make him seem like a bad guy, all he was was a kid who made some bad decisions and got mixed up with the wrong people (or person). I really don't have any clue how much of the story was true, but anyone who watches this movie needs to remember that like you said, at least some of it (and maybe a lot of it) is exaggeration...and beyond that, Zuckerberg was just a kid when he created Facebook. Just because his mistakes involved a lot of money doesn't necessarily make him worse than any other kid who screws up at that age.